Since 95% of fires have water present, Fire King has desiged these cabinets to prevent water damage resulting from sprinkler systems and hoses. This is earned this model the ETL water resistance fire rating. 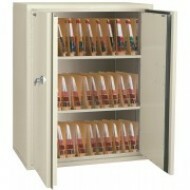 All FireKing files come standard with a Medecco high-security key lock. 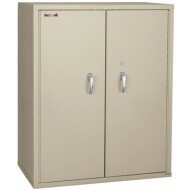 This medical storage cabinet has a 1/2 Hour ETL Rating: This fireproof records storage cabinet is certified to protect external hard drives, thumb drives, flash drives, memory cards, CD's DVD's from heat for 30 minutes. Introducing the Fire King Storage Cabinet CF7236-D at 72" tall offers big protection for oversized documents, binders, end-tab filing, Bankers Box, and other valuable items. The CF7236-D Fire King Storage cabinet comes equipped with 4 adjustable shelves ,each of which can hold 160lbs of weight. This cabinet is also equipped with a high-security Medeco key lock and scratch-resistant finish – providing a lifetime quality appearance. 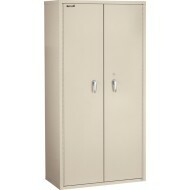 This storage cabinet has been awared a a UL 1 hour fire classification.